I just couldn’t resist… another city-builder, Foundation, has joined my Steam library. Somehow, there is always space for one more of that genre. Oh no….I feel time disappearing. 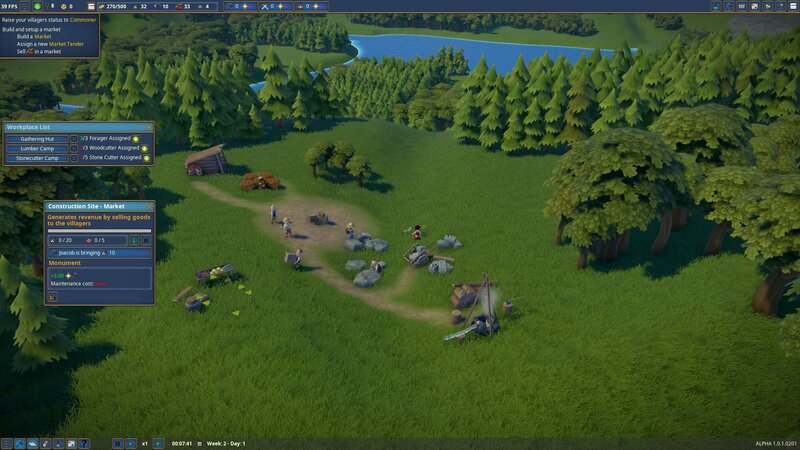 This looks like Medieval Banished. In a way yes. It is a city-building game, but it’s lacking the harsh survival part that Banished has. It is in Early Access, so this could all change later on, of course. I didn’t get attacked by anything or anybody and there are no seasons in, so there is usually no food shortage (unless I don’t have them produce enough or accidentally have them trade away too much). What I really like is the micromanagement in that I can choose which of my villagers gets to work in which job and that I can extend certain buildings with addons (an extra room for my church, so more villagers can attend, for example).